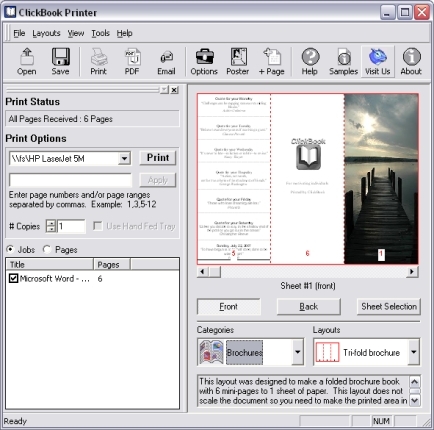 ClickBook, is an award winning printing utility, that lets you print customized day planner pages, booklets, brochures, greeting cards, catalogs, banners, posters, bulletins, and more from just about any application and even the Internet! ClickBook scales, rotates, paginates, and duplexes your books, novels and digital photos into 170 different mobile and convenient layouts. Now ClickBook can even convert documents into PDF files!